originally began as a University of Stirling graduate project. 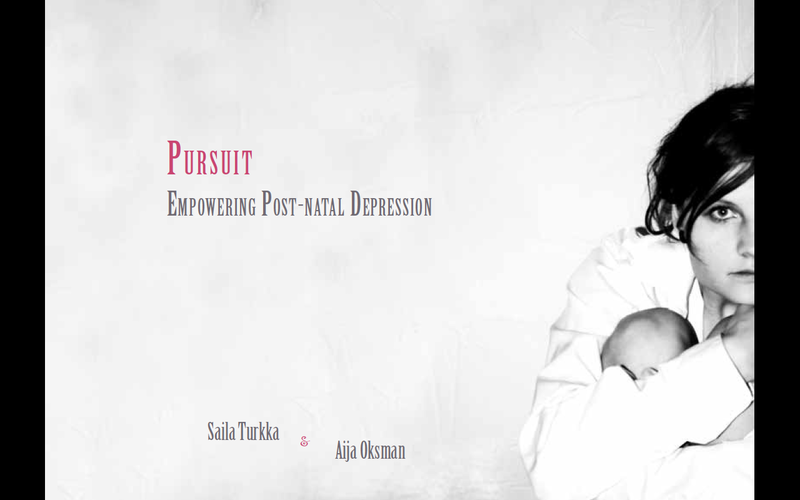 But the more material Saila Turkka, the woman in the pictures and the author, provided for me the more it became evident that this is something much more than a project. Pages were added, ideas grew and ultimately Saila and I decided the project is a sample of a full-length book, rather than being a book. 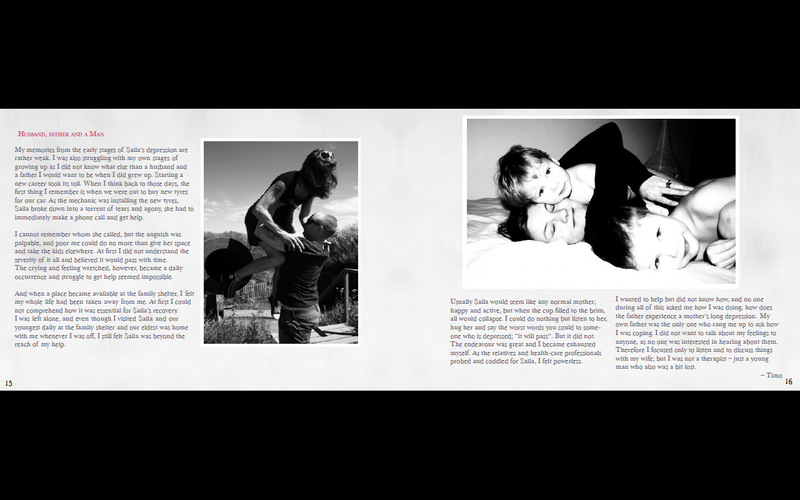 Therefore, the pages you see here are examples of what is in planning for a feature-length novel of Saila’s experiences as a woman, mother and a wife suffering from nearly debilitating post-natal depression, and her subsequent struggles with finding help and the life-changing impact of empowering photography. Empowering photography, including empowering drawing and writing, enabled Saila’s recovery together with more sympathetic care-givers and medication. The results of the therapy are largely gathered in the book, and in this sample most of it will be exemplified. The cover of Pursuit sets the medium of the whole book. The design was decidedly simple, allowing the pictures and words speak for themselves, rather than have the design and composition take over. A lot of the photos are black and white or on grey-scale and as Saila’s successful blog features a major splash of pink, we settled on simplicity – grey-scale with pink. Back of the project has a similar albeit less haunting photo. From the beginning it was obvious that although Saila would be writing her story in her own words, allowing us a glimpse into what she went through, there would not be enough space for absolutely everything, not for the sample alone. Especially as we wanted to include as much of her original poetry as well as possible. Therefore, the spreads with poetry have been coined with a photo that would most illustrate the sentiment and emotions in the poem. Near to the end of the project, a strong sensation that something was missing came clear. Ultimately together with Saila we agreed that what was missing was the father’s voice. No one seems to think of the man, the husband, the father behind all of this, generally it is thought that post-natal depression is a woman’s issue alone. Fact is post-natal impacts the father as well. Both as the spouse of a sufferer or the father can be a sufferer too, as post-natal depression is not, against the common belief, only hormonal. The photos used in the project and throughout Saila’s therapy were, and still are, mostly taken by Timo – he has always been very supportive and very much involved in the empowering and rehabilitation of Saila. But did anyone ever ask him how he was coping, how he felt? Apparently not. 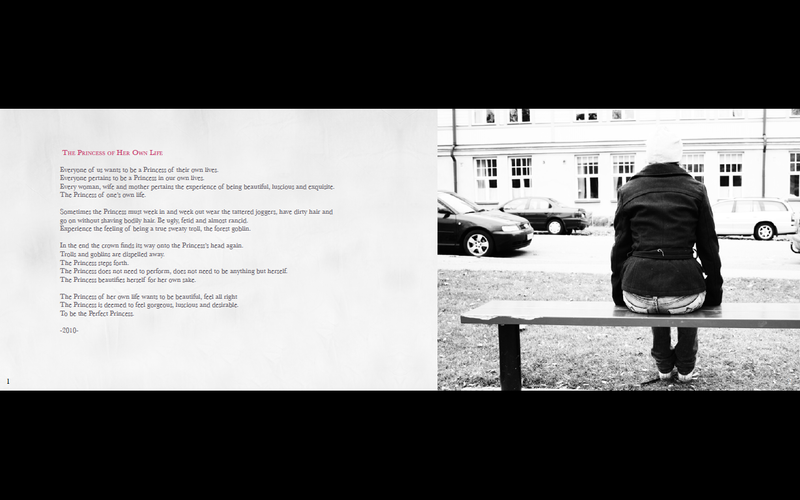 Therefore, Timo’s story was added to the project; in the same way as Saila’s story, Timo wrote his own part. Some pictures took more designing and editing, some were perfect for the situation and part of the story or poem as they were. On this spread there is a good example of each. On the left is a photo from later stages of therapy, with better camera equipment that Saila had eventually got for herself, whereas on the right is a photo from during the guided therapy session, which originally was coloured and taken on an old, small hand-held digital camera. 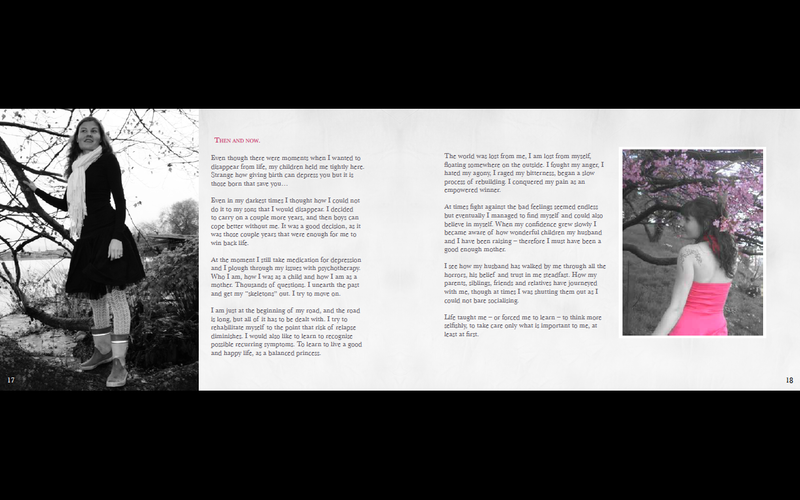 The photo was stripped of colour except for Saila’s vivid pink dress and the beautiful cherry blossoms. Äidiksi” exhibition in 2010 in various locations in Finland. As this is a continuous work in progress, for progress please visit out blog space The Princess of her own Existence, and for any enquiries do not hesitate to contact me.